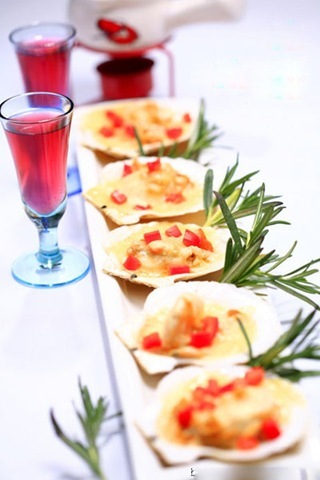 Chinese people like excitement of the occasion.Western cuisine is so popular, I also follow the people’s step, cook Baked scallops with garlic and cheese to everybody. 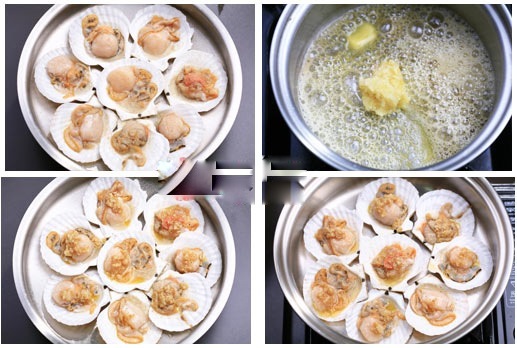 Use knife forced open Scallop shell , along the scallop (that is the white meat at the center ) side , remove that shell, the internal organs, water wash, dried for later use. 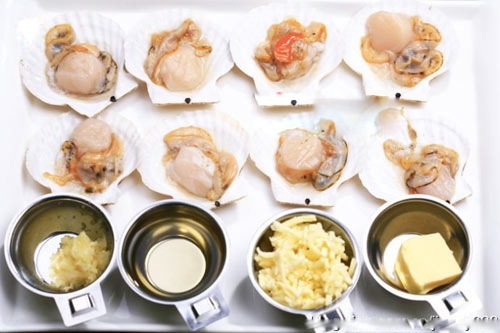 With a little salt, pepper, white wine would Scallops marinated for 10 minutes. Crushed garlic, so that melt butter, add garlic. a few seconds later, add salt and pepper, garlic butter sauce evenly on the scallops. Preheat pan, add the scallops, about 3 minutes, until cheese turn color .Baked scallops with garlic and cheese is finished. For salmon, I have a special feeling.Although I’m not used to the taste of Sashimi. Last night, a friend gave me a salmon. 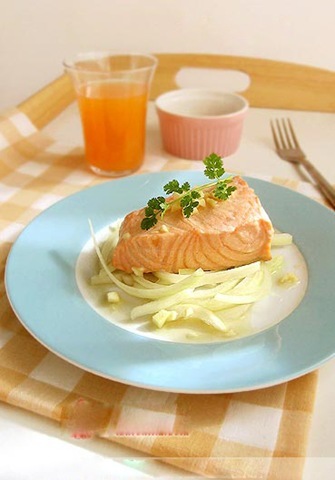 I decide to cook Steamed salmon. At first, take a tape, not too shallow dish, because the steamed fish soup will be out. Put a layer of onion and mushroom pieces, and finally sprinkle some shredded ginger. Lastly, take a small bowl, it is used to hold the flow out of the soup which had just steamed fish, then add chopped garlic, point a few drops of soy sauce, plus a little bit of sugar, mix well and pour over salmon, and sprinkle a little above coriander. The Steamed salmon is finished.